What is the purpose of the kilt belt? Well its not what you might think. Its not to hold up your kilt, this is done by the kilt's own leather straps and buckles. The only purpose that the belt serves, is as additional decoration for your kilt. 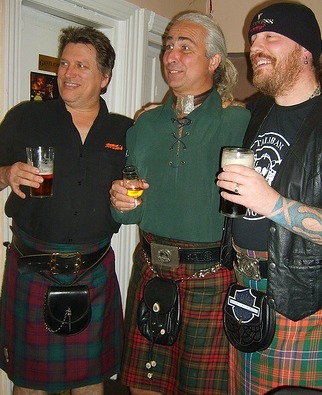 So why has it become an important accessory to your kilt? It's history dates back to the Feileigh Mor, also known as the Great Kilt. This was an non tailored garment which was fastened at the waist with a broad leather belt. And so you have its origins, and although it is fastened securely around the waistband of your kilt, it is in no way holding it up. The belt is normally made from black leather, and is approximately three inches wide (although this can vary), and can be decorated in many ways often with Celtic tooling, or if you prefer, plain (as mine is). A good example of a typical belt can be seen in the photo below. It shows very clearly how the belt is worn, and note, it is in no way holding the kilt up. A good quality belt will be made from full grain leather, and not splits of leather that have been stitched and padded. With a good handcrafted belt, you then have an accessory for your kilt that will last many years, and indeed will improve with age as the full grain leather will soften as it get older. The next photo shows three very different belts, the one in the middle as you can see is very decorative with lots of tooling, whereas the other two are somewhat simpler in design. Probably the most important feature of the belt is its buckle, which again can be very decorative, or depending on your preference quite simple, as seen in the photo above. As the purpose of the belt is decoration most people do opt for a buckle which is highly decorative, they can range from clan crests to Masonic symbols, Celtic knots and everything in between. As you see the Gentleman in the next photo has chosen a highly decorative buckle for his belt, even though it is being worn as day wear. So as you can see from the photos above, you have a huge choice when it comes to choosing a belt and buckle for your kilt. Indeed many people find the choice so big, that they often find themselves buying more than one. There is however one occasion when you would not wear your kilt belt, and that is when wearing a waistcoat (vest) with your kilt jacket, as the belt is hidden by the waistcoat, and spoils the way the waistcoat lies. If you would like any further information, then please drop me a line using the Contact Us page.